Belmont Harbor is located in the heart of beautiful Lincoln Park and is one of the largest harbors in the Chicago Harbors system. The harbor is surrounded by acres of park space and a stunning skyline view to the south. 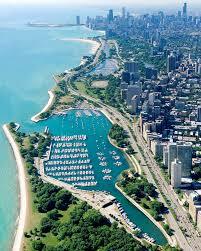 Belmont Harbor is the home of several yacht clubs including Chicago Yacht Club. This entry was posted in AtoZ Blog Challenge April 2015 and tagged Belmont Harbor-Chicago, Facing East-Novel, Stepheny Houghtlin-Author. Bookmark the permalink. Lovely post, keep them coming. Sending them all the way to England, especially to you! What a coincidence, I think of YOU as my kind of girl! Lovely, Stepheny. A great place to sail from! Thank you for taking the time to read this post. Let’s pretend….I will meet you on Michigan Ave for tea. Take public transportation or splurge on a cab from the airport. We can finally meet in person.OR come back and see me while I continue to write other things about Chicago and the area. I’m going to start with a pot of Earl Gray or Lady Gray tea. My favorites. to our childhood days and encouraging others to visit Chicago if they haven’t. Delighted you are taking the time to read these April posts. D is about the Asbury House where you spent so much time being my dearest friend.